Zestos: Enabling life through communication of research: Increased storage - both good and bad? We live in fortunate times. We know enough about nutrition that we don't see diseases that occurred a one to two hundred years ago. Rickets - the bowing of young childrens bones caused by insufficient vitamin D no longer haunts us as parents. This was caused by not getting out in the sun in winter and the high pollution levels causing reduction in sunlight. Scurvy at the end of winter, caused by no access to fresh fruit or vegetables over winter doesn't concern us, nor does lack of vitamin B's causing a host of other issues. One of the reasons for this is cheap storage and shipping of produce. We all have access to a fridge and cool stores keep the fruits viable for months. Hydroponics and importing keeps "fresh" vegetables on the menu all year round. Also the application of research, fertilization, mass production of food keeps the prices low. As much as we might complain about high fruit and vege prices compared to two hundred years ago we live in an age of decadence. However the down side to this is that the fruits and vegetables we consume are generally lower, often extremely lower in nutrients than the "home grown" food stuff. So our food keeps us healthy enough not to get clinical deficiency but not healthy enough to prevent colds, flue, snivels in the short term and western degenerative diseases in the long term. Therefore it is with mixed emotions I read about covering papaya with a "natural shell" thus enabling it to be preserved for longer. This substance is call chitosan. Chitosan is a type of complex carbohydrate and is the substance that shrimp, crabs etc create to use as their shells. This substance can be modified to coat various things, including fruit. It has a natural preservative action being anti fungal. It would also seal the fruit off from the air, thus reducing oxidation (ie going off) and exposure to pathogens (ie no fruit spores). Therefore the papaya can be stored for five weeks. 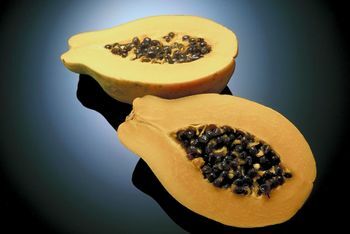 This five weeks would give papaya produces enough time to ship the product to markets in other countries. Thus we might see papaya more cheaply in the supermarket in the future. Hence my mixed emotions. One side of me says that it is great to be able to purchase papaya cheaply. However on the other side it has come a long way from home over a significantly length of time. Therefore it would make sense to instead befriend my neighbors and eat the fruits that are in abundance around me that are freshly picked. So eating local and fresh is still the best option.